Frantz Group is a comprehensive content development agency, capable of providing robust content pieces directly for your use, and also as support for our customers’ marketing campaigns for demand generation. Services include concepts, production, and delivery of a variety of creative elements. We understand the value and absolute imperative of adhering to corporate brand guidelines, and are able to be truly creative “within the box” by contributing innovative and impactful direct marketing campaign materials. Looking to get outside the box? Our digital marketing services include a number of options for testing and iteration to help improve both your UX (user experience) as well as your conversion rates, so people actually see the content that you’re creating. Our Marketing Foundation services help assist with this process. The most effective marketing and demand generation campaigns incorporate multiple and diverse touch-points that help align with the prospect buying cycle. Compelling messages, effective offers/calls to action, sequence/timing, personalization, brand consistency, truly great creative – all are necessary ingredients of a successful program. Frantz Group brings over two decades of experience and rigorous project and creative management processes to the development of integrated campaigns and communications, ensuring campaign materials are in market, on time, on budget. 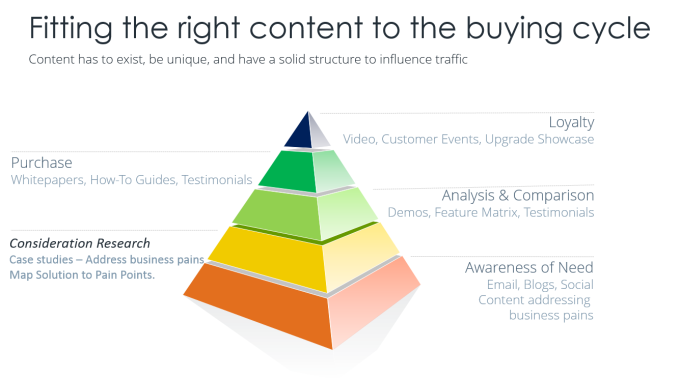 Want to gain a better understanding of what content to use where? See our companion article covering how to fit technology solution content to the buying cycle. What used to be called collateral has evolved into content. The words, “can you send me more information” are still heard and must be responded to, but most commonly, today’s buyer searches for and finds information independently online. We must all be content publishers in today’s world; if a company’s information is not accessible, easily understood and showing a clear value proposition, that company will find itself at a serious disadvantage in the marketplace. Frantz Group Content Services was introduced to corral all relevant services and their deliverables under one umbrella, so that our clients can best understand the palette of tactics / components now available to them. Targeted content is a necessary ingredient to successful demand generation campaigns. Frantz Group Content Services provides content development support to create meaningful documents and materials that help reinforce demand generation and sales messages, engage and maintain a dialogue with interested prospects, and increase urgency / interest in further interaction. Such materials include: websites and web content, solution briefs, use cases, case studies, press releases, feature articles, PowerPoint presentations, promotional and instructional videos, and more. We are keenly aware that prospects are looking for evidence of positive ROI and business value when they read your company’s materials, and FG will ensure they find it.